When it comes to cocktails, I love them bright and sour, with notes of fresh, herbal flavors. I especially love those that feature pure passion fruit pulp--as no matter where I am, something about the flavor instantly makes me feel like I am on a vacation. Last year, on the shoot for our engagement photos, we took a break for lunch at a Cuban restaurant in the Meatpacking district called Son Cubano. I spotted a passion fruit mojito on the menu and ordered it, quickly falling in love with the combination of fresh passion fruit and herbs. 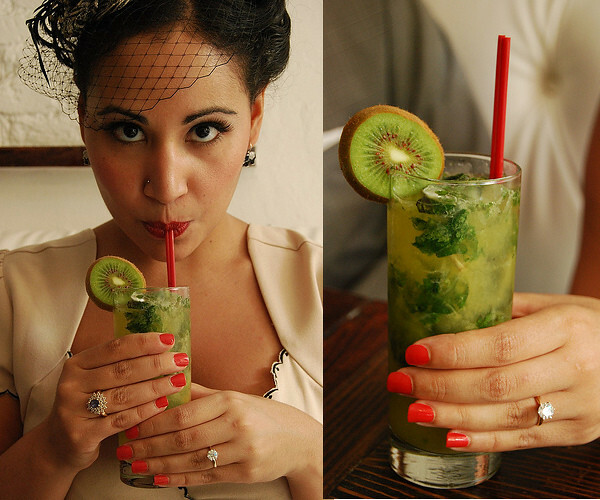 A photo of my hand holding the drink ended up becoming the "ring shot," and I went home determined to recreate the cocktail. Having recently come into a bounty of fresh basil at the farmer's market, I decided to swap out the mint for basil to see how it would work. It was fantastic! The fresh basil worked beautifully with the passion fruit and it quickly became my favorite. I am now going to confess to you that I actually wrote this recipe and took these photos LAST June. Unfortunately, in the midst of all the crazy wedding planning I never got the post up, and so I filed it away all fall and winter long, waiting for the Summer and basil to come back in season so that I could share it with you. It's finally starting to heat up again, and basil will be popping back up in the markets any second now so it's the perfect time to share. This take on a classic mojito features fresh basil and pure passion fruit pulp for a refreshing and tangy sweet and sour cocktail. Feel free to adjust the amount of sugar or limes if you prefer drinks a little sweeter or a little more sour. Makes 4 cocktails; can be doubled or halved as desired. Prepare 4 high ball glasses by filling with ice. 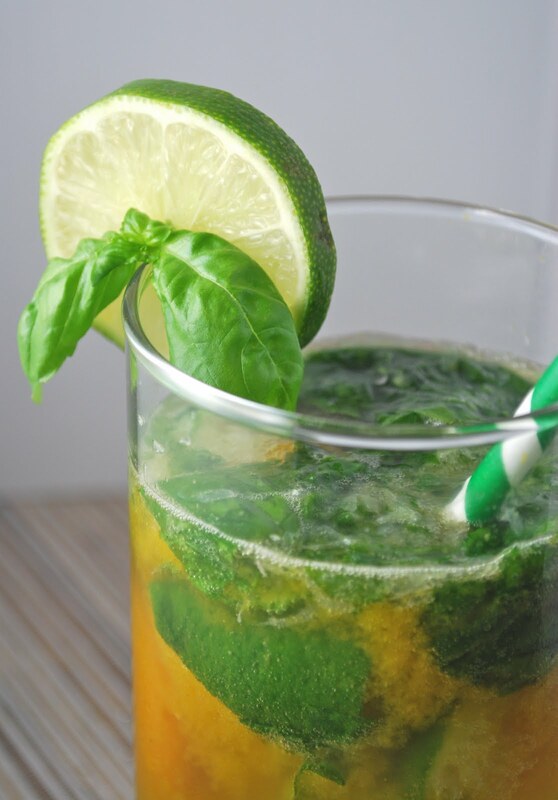 Combine 12 of the basil leaves and 12 lime wedges in a large beverage shaker. Use a muddler, pestle, or wooden spoon to mash and muddle the limes and basil leaves together, releasing as much lime juice and oil from the basil leaves as possible. Add the ice, white rum, and passion fruit puree. Shake well and divide into the 4 prepared high ball glasses. Tip: If you don't own a beverage shaker or want to make a larger batch at one time, use a large bowl and follow all steps, just stirring the ingredients vigorously instead of shaking.